(NORTH BAY, ONT.) 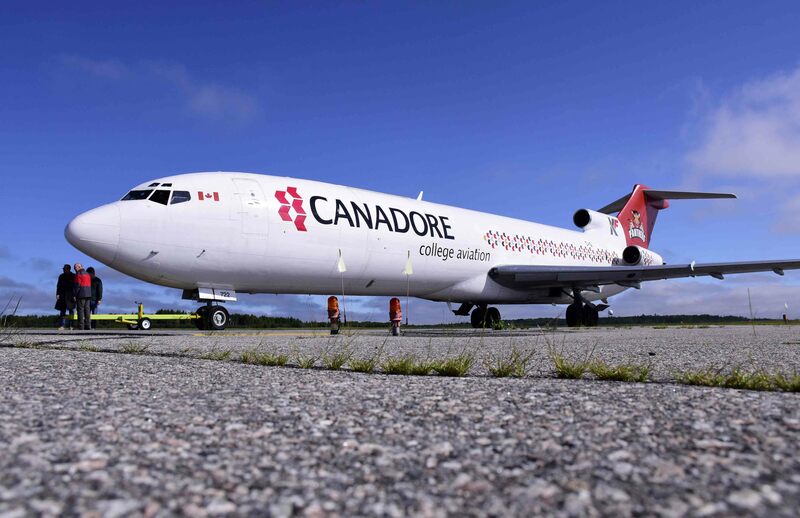 – Canadore College formally accepted the donation of a Boeing 727-200 aircraft from KF Aerospace earlier today. The commercial plane, serial number 21042, was most recently configured for freight and retired from carrying Purolator shipments between Canadian destinations for 17 years and over 11,000 flight hours. The gift of the B727 will be extensively used as a hands-on training aid for students in the Canadore College School of Aviation Technology. The aircraft was recently appraised at a value of $795,000 and Canadore College created a purpose-built parking pad adjacent to its hangar for permanent placement of the training aid. This semester’s aviation students have already incorporated the grounded aircraft in the classroom experience to complement the College’s other training aids. KF Aerospace (formerly Kelowna Flightcraft) provides aviation engineering, maintenance, training, air cargo operations, and aircraft leasing to commercial and military customers around the world. Powered by 800 skilled staff, KF owns and operates over 50 aircraft, and modifies and maintains over 100 customer aircraft annually; at locations in Kelowna, BC, Hamilton, ON, Vancouver, BC, and Southport, MB.